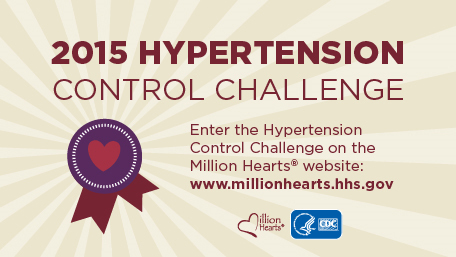 Enter the Hypertension Control Challenge on the Million Hearts® website: www.millionhearts.hhs.gov. The Million Hearts Hypertension Control Challenge recognizes exemplary public and private practices and providers that achieve sustained hypertension control rates of 70 percent or above. The challenge was developed by the Centers for Disease Control and Prevention in support of Million Hearts, an HHS initiative aimed at preventing 1 million heart attacks and strokes by 2017. Nearly one in three U.S. adults – or about 70 million people – has high blood pressure. Of that group, only about half has it under control. High blood pressure is a major risk factor for heart disease and stroke, two of the leading causes of death nationwide. In 2013, high blood pressure was a primary or contributing cause of death for more than 360,000 Americans – that is nearly 1,000 deaths each day. Blood pressure management, a key strategy to prevent cardiovascular disease, is strongly emphasized by Million Hearts. Since 2012, Million Hearts has recognized 41 Champions that care for 12 million patients from small and large, urban and rural, and private, federal, and tribal health practices and systems. Past winners have used a variety of evidence-based strategies including hypertension treatment protocols, self-measured blood pressure monitoring, health information technology, and team-based care. To enter the challenge, applicants must provide information about their practice, share verifiable high blood pressure control data, and describe how use of health information technology contributed to their success. Examples could include electronic health records, incentives for providers and patients, team-based care, and community involvement. The deadline to submit a nomination is before midnight on Oct. 31, 2015. For more information about the Hypertension Challenge, previous winners or to access resources, visit http://millionhearts.hhs.gov. Million Hearts is a national initiative to prevent 1 million heart attacks and strokes by 2017. Million Hearts brings together communities, health systems, nonprofit organizations, federal agencies, and private-sector partners from across the country to fight heart disease and stroke.